Along with cheese and bread, wine is another national symbol of French culture (and superiority). As the world’s top exporter of wine, France is globally renowned by consumers and professionals alike for its high quality wines and the regions they are named after – Bordeaux, Burgundy, Champagne, Alsace, Côtes du Rhône, to name a few. But in recent years, scientists have voiced concerns about the effects of climate change on these regions, and how rising temperatures may influence cultivation and production. As I mentioned in my last post, the French have a long history of government involvement in food production, with laws regulating the Rocquefort-making process going back to the 15th century. Wine holds a similar deeply-rooted historic place in the French national and cultural identity, but in fact viticulture was not included in AOC considerations until 1905. 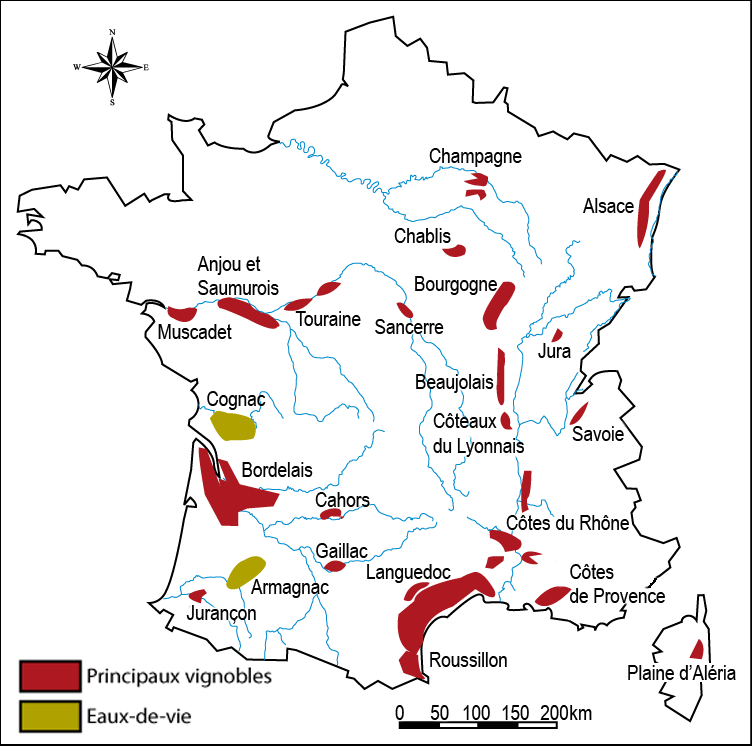 Today the French wine industry (like any other agricultural-related industry) is regulated by a government bureau that designates the appellation d’origine contrôlée (AOC), a certification given to certain wines based on the idea of terroir. Terroir: in agricultural production, the combination of geographic and human factors that combine to produce a specific product tied to the land and history. Terroir can be interpreted as the specific identity of a product that stems from various physical factors (climate, geology) that create certain conditions influencing the eventual nature of the product, in combination with methods of production that are highly-regulated and steeped in tradition. This means that each AOC product has a direct relationship to specifically-designated regions that create conditions for production that have been historically recognized as unique or of high quality; at the same time, producers who work in such regions must uphold traditional methods in order to maintain their AOC certification. Where climate change comes in here is quite obvious. As the name implies, the climate of these AOC regions (arguably the most essential aspect of terroir) will change. This means that everything about the wines will change, since wine-producing grapes are some of the most fickle agricultural products. A 2005 study found that temperatures in some of the worlds most productive (and famed) wine-producing regions had risen by 1.26 degrees celcius; in Southern France, this number was closer to 2 degrees. 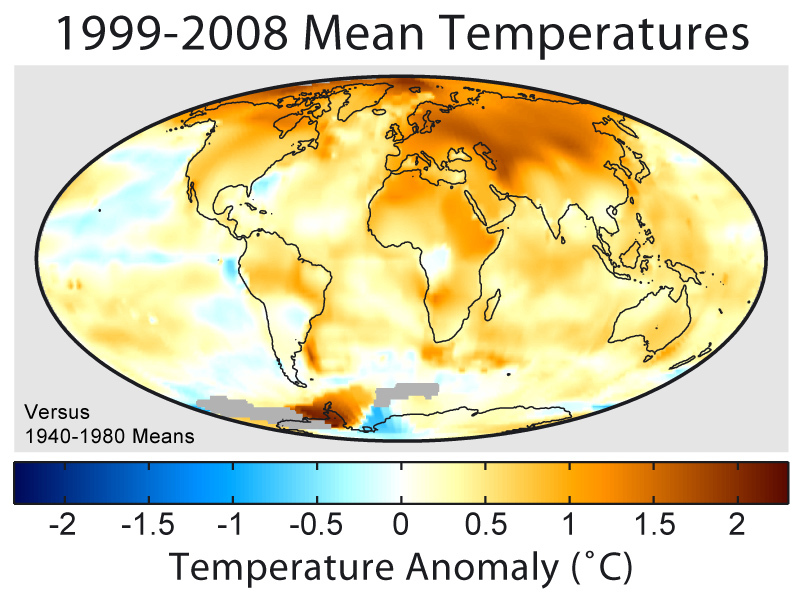 The study concluded with a prediction of an additional 2 degree rise by 2049 in relation to the current state of global warming. Even the slightest change in temperature, irrigation, or soil quality will give the wine a vastly different flavor. If the climate itself is different, (and as predicted, not as favorable for viticulture due to higher temperatures) can these wines still be labeled as AOC? Will the French wine industry be boxed in by its region-based designations of quality when such regions stop producing quality? There are, of course, some measures that can be taken to combat the effects of climate change. These include additional irrigation, greenhouse methods, and the use of genetically modified varietals. But in employing such methods, producers would undoubtedly be in violation of the specific production rules set out by AOC standards, and subsequently lose their certification. Ultimately the question here is the validity of AOC, and whether or not it can persist as an appropriate designation of high quality wine in today’s changing world. The sad truth is that French wine may be on its way out – or must find modern ways to adapt in order to survive. Posted on November 18, 2014 November 18, 2014 by srchristofferson	This entry was tagged agriculture, AOC, bordeaux, burgundy, climate change, cuisine politique, France, French wine, global warming, grand vins, terroir, vin, wine. Bookmark the permalink.